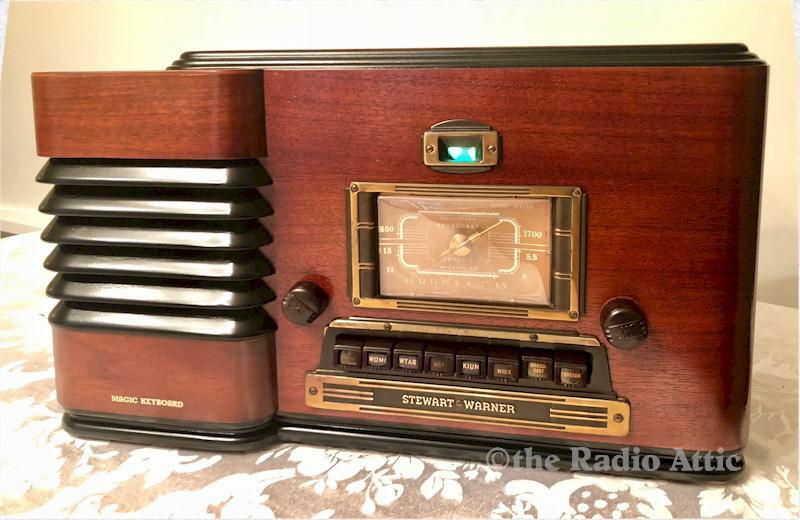 Stewart-Warner without question produced some of the most beautiful radios ever seen and their "Zephyr," with its wrap around grille, preset push buttons and a green magic tuning eye is simply amazing "eye candy!" The separate tuning eye bezel, dial bezel and the "Magic Keyboard" push button presets really emphasize the cabinet, not to mention the louvered grille, abundant curves and a multi-level top. The cabinet has been refinished using the very finest toning and finishing lacquers, producing a gorgeous luster. The old dial cover was replaced with a new one. The electronics have been completely restored (no shortcut repairs, internally fused for your safety and has a new polarized power cord and new tuning eye), and it plays very nicely on both the AM broadcast and the shortwave band. I have also added an MP3 audio input so you can listen to your own selected music. 17-1/2"W x 10-1/2"H x 8-1/2"D.